Touched by the plight of the villagers he met who suffered needlessly from curable diseases simply because of ignorance and lack of access to care, the Third Jamgon Kongtrul Rinpoche was moved to establish a clinic to serve them. 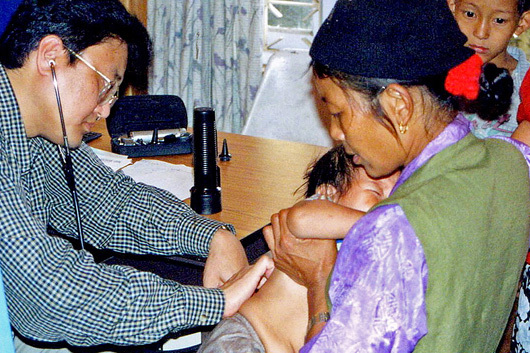 The Jamgon Kongtrul IIIrd Memorial Health Care Centre opened in December 1995. In addition to primary health care, the clinic also serves as a link with the diagnostic and treatment facilities in Kalimpong (1 hour away by car) and Siliguri (3 hours by car). It was the only health care facility in the area for many years until 2007. Today, it is still the major health care facility for 32 remote villages within a 25 kilometre radius of Lava village. To benefit the poor, the cost of healthcare is basically subsidised through donations. A token fee of Rs.10 is charged for consultations. Medications are sold at cost and those donated to the clinic are given free. The clinic has a resident nurse. A doctor trained in western medicine and a pharmacist visit weekly. The doctor and nurse are familiar with the people, their customs and traditions, and have the trust of the community. In addition, the doctor has excellent working relationship with other health care professionals in Kalimpong and Siliguri.